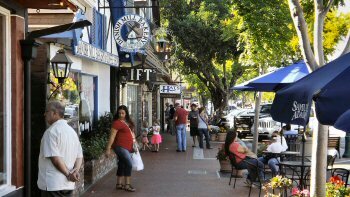 Solvang California - A lovely town founded just over a century ago by Danish immigrants, Solvang presents the best of northern European culture in the sunny Santa Ynez valley. Solvang California - Santa Barbara County seems an unlikely place to find a quaint northern European village complete with windmills, aebleskivers and thatched roofs. Especially right next door to a Spanish mission (Mission Santa Ines), in a valley with a strong cowboy horse culture and just down the road from the Chumash reservation. Truth to tell, anywhere seems unlikely for such a combination. But once you arrive here it doesn't feel strange. In fact, it somehow seems right. Perhaps the quirkyness is something that Central California shares with its northern and southern neighbors. 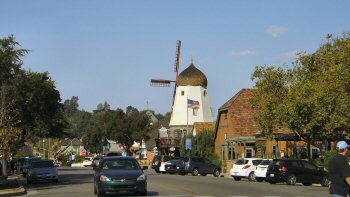 Solvang (Danish for "sunny fields") was founded in 1911 by Danes seeking to escape midwestern winters, a worthy goal. Almost everywhere you look in Solvang, you will see Denmark. The houses and commercial buildings are built in Danish style such as the timbered houses shown here. There is a monument to Hans Christian Andersen, along with a park named after him and a replica of his childhood home. At 1680 Mission Drive, you will find the Book Loft where you can find the Hans Christian Andersen Museum. Worthy of your time is the Elverhoj Museum of History and Art. Danish and Solvang history, Viking history and other exhibits. 1624 Elverhoy Way. The Elverhoj also has a pdf file here that explains and translates all those Danish street names in Solvang (requires the free Adobe Acrobat reader to view). While you're shopping, you can send your husband down to the Solvang Vintage Motorcycle Museum at 320 Alisal Road. 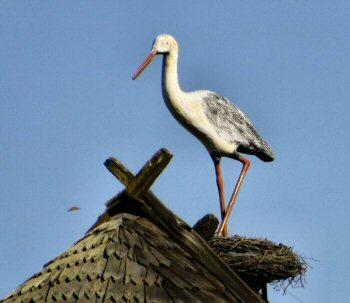 There are storks found on many of the roofs in town (wooden replicas) and some of the roofs are thatched. There is the windmill of course which is visible through much of the town. 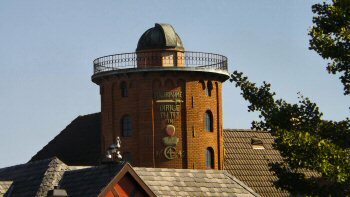 Then there is a ⅓ scale replica of the "Round Tower" which was built in Copenhagen as an observatory. There is much more, but I'll leave that discovery to your trip there. Solvang is a fine walking town, but if you'd rather ride, there is a nice horse-drawn trolley the makes its way up and down the main street. Even though there are many wineries in the area and opportunities for wine tasting in Solvang, the grape is part of its adopted California culture. Denmark is too far north to allow grapes to ripen for wine making. What the Danes are able to raise is wheat and dairy cows. And that means pastries! 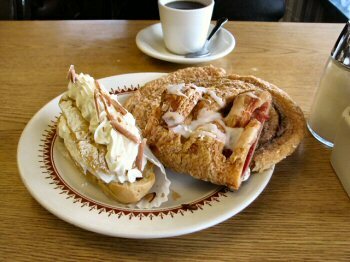 There are a number of Solvang bakeries, any of which have great items. One of our favorite is the butter ring. It's a masterpiece of pastry making. But man does not live on pastries alone - for a real meal there are great restaurants with Danish dishes like wonderful sausages and aebleskivers. Antiques, art, books, clothing, toys, chocolates, jewelry and Christmas items are just a few of the categories of shops you will find in Solvang. And pastries, did I mention pastries? There are a number of great independent hotels and inns to be found in Solvang. Hotel Corque - Solvang’s newest hotel, Hotel Corque offers 122 rooms, including 16 specialty suites and the Chairman’s Suite. The hotel also boasts over 7,500 square feet of flexible meeting space. Hadsten House - 75 deluxe remodeled spacious units, Solvang's ONLY indoor heated pool with game room, complimentary expanded Continental breakfast, fresh perked coffee in rooms. King Frederik Inn - AAA Three Diamond Award. 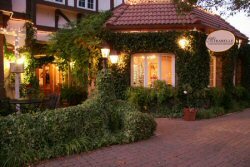 King Frederik Inn is located in the heart of Solvang, close to all shops and restaurants. Mirabelle Inn - Mirabelle Inn and Restaurant - Solvang’s top rated inn and restaurant with 10 elegantly appointed rooms and suite with fireplaces, some whirlpool tubs. Rates include a delicious breakfast. Petersen Village Inn - Located in the heart of Solvang, this charming 40 room Inn offers canopy beds, a variety of views and all the amenities of a AAA Four Diamond Inn. Accommodations include a Full European buffet. There are at least a dozen tasting rooms right in the confines of Solvang itself, with at least 60 wineries total in the Santa Ynez valley. 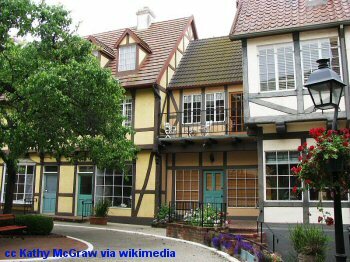 Solvang could certainly be a base of operations for a lovely weekend wine tasting excursion without getting very far from the town. 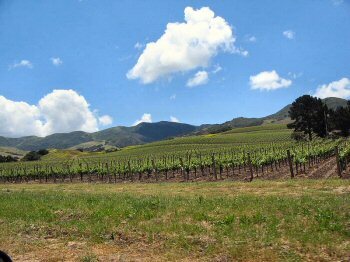 The Santa Ynez Valley is an up and coming wine area that is gaining recognition alongside Paso Robles to the north. Los Olivos, Ballard, Santa Ynez, Foxen Canyon - these are all short and easy drives from Solvang California. One more backroad drive worth mentioning is Alisal Road which isn't long and leads to Nojoqui Falls Park.